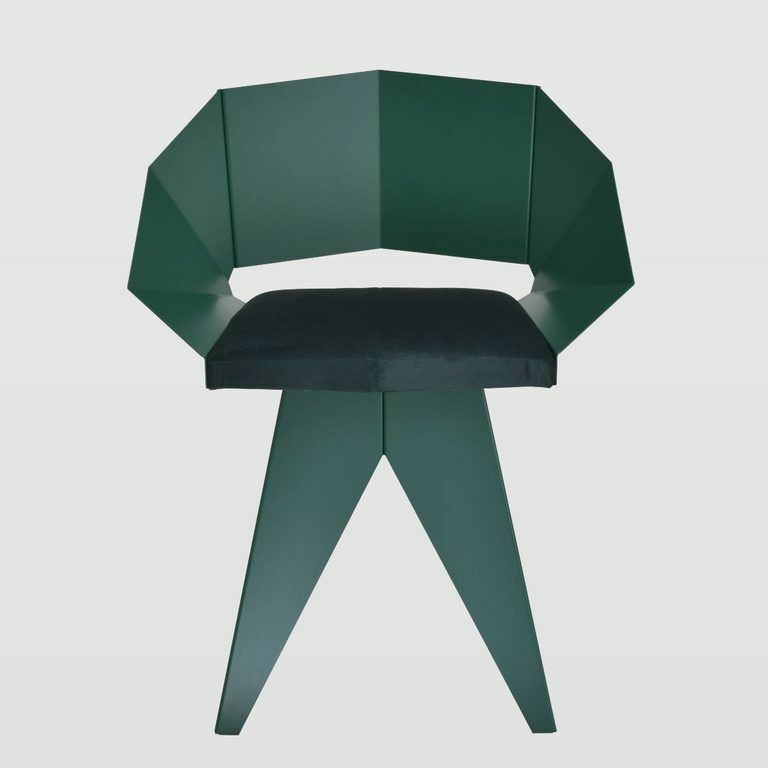 Knight chair with a geometric shape. 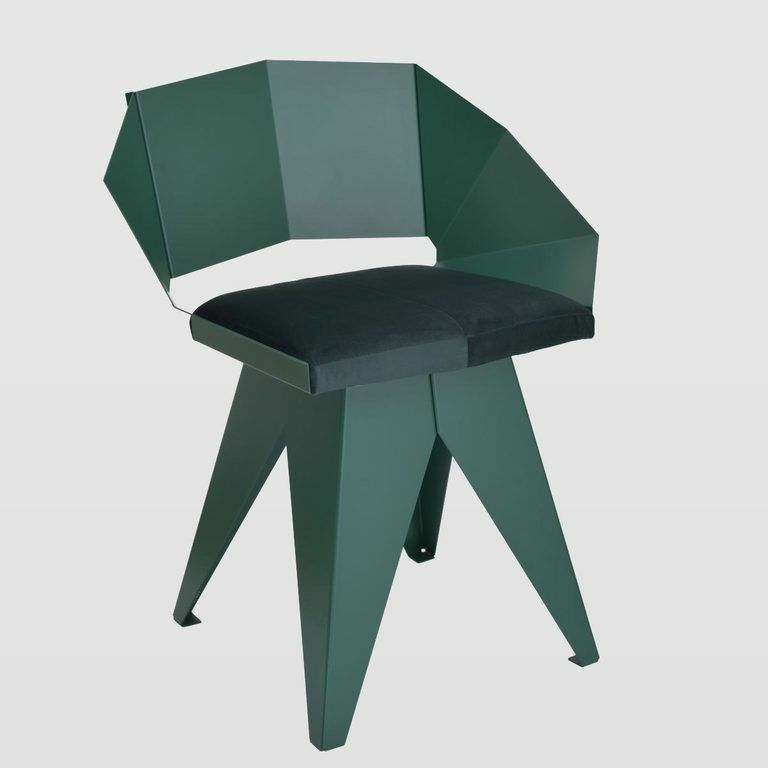 Backrest and base made of steel painted matt green color. Seat upholstery made of foam, covered with velor fabric dirty pink. Legs made of steel are solid and strong. They have protection to protect the floor from scratches. 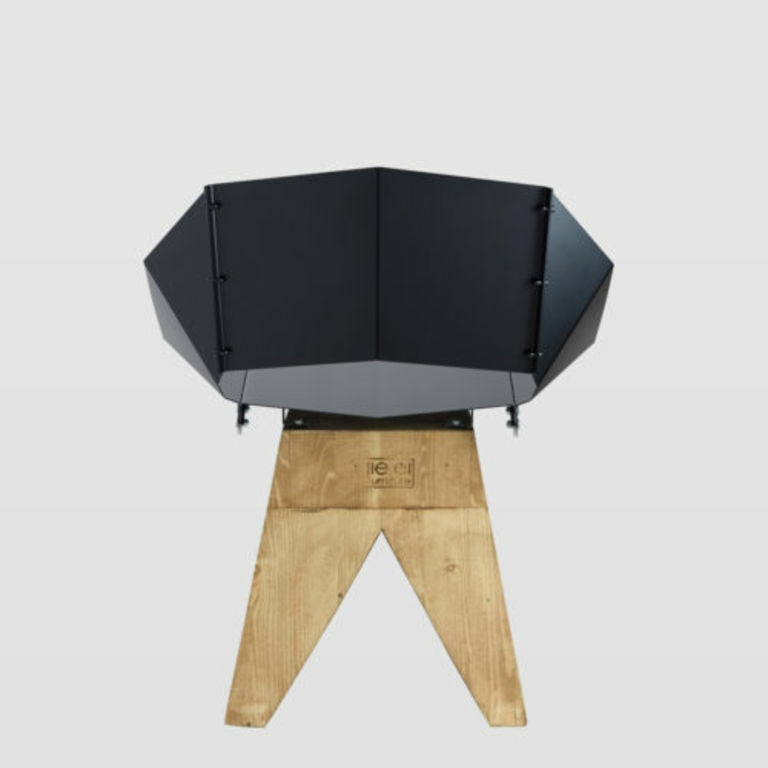 The chair withstands a maximum load of 80 kg. 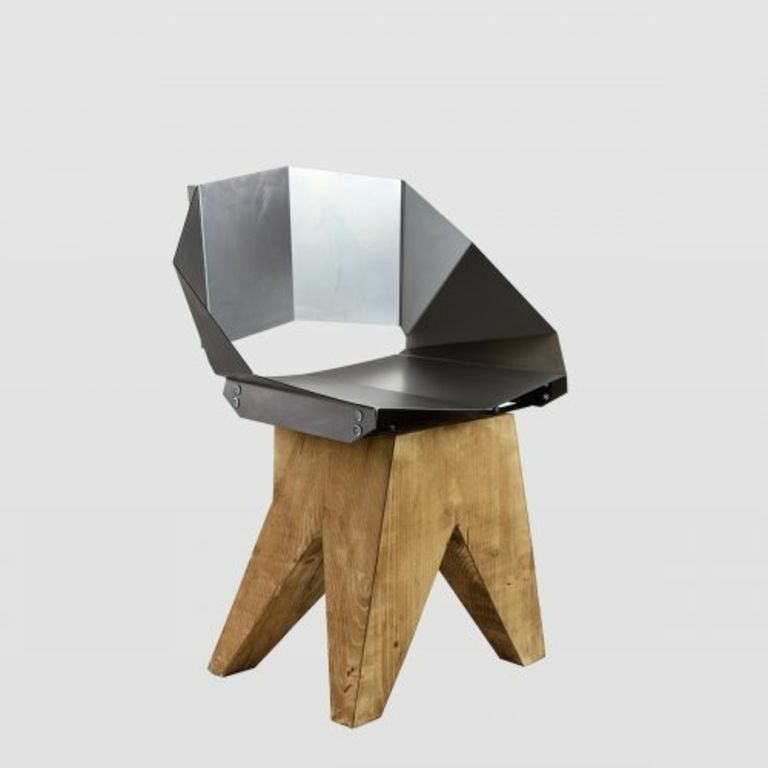 Knight chair can be used as a dining chair. 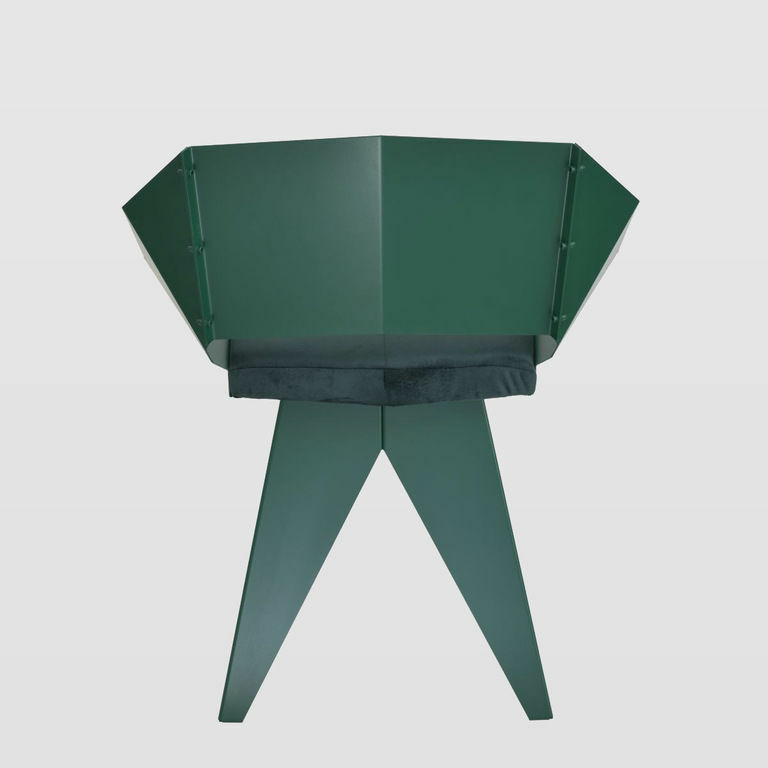 Thanks to its standard dimensions it will fit most kitchen and dining tables. Black color makes Knight fit into interiors decorated in industrial, loft and modern style. It fits perfectly with wood, metal and brick wall. Beautifully contrasts with brightly colored walls and furniture. 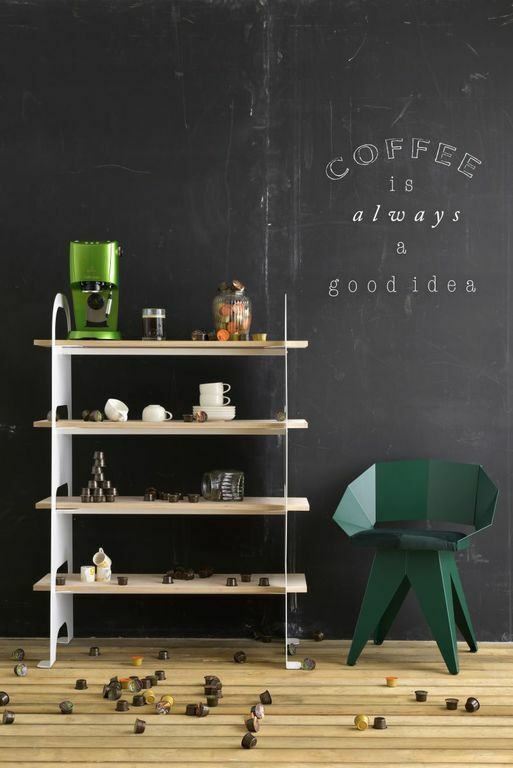 Knight is a brave proposition for people who are not afraid of using unconventional solutions in their interiors. 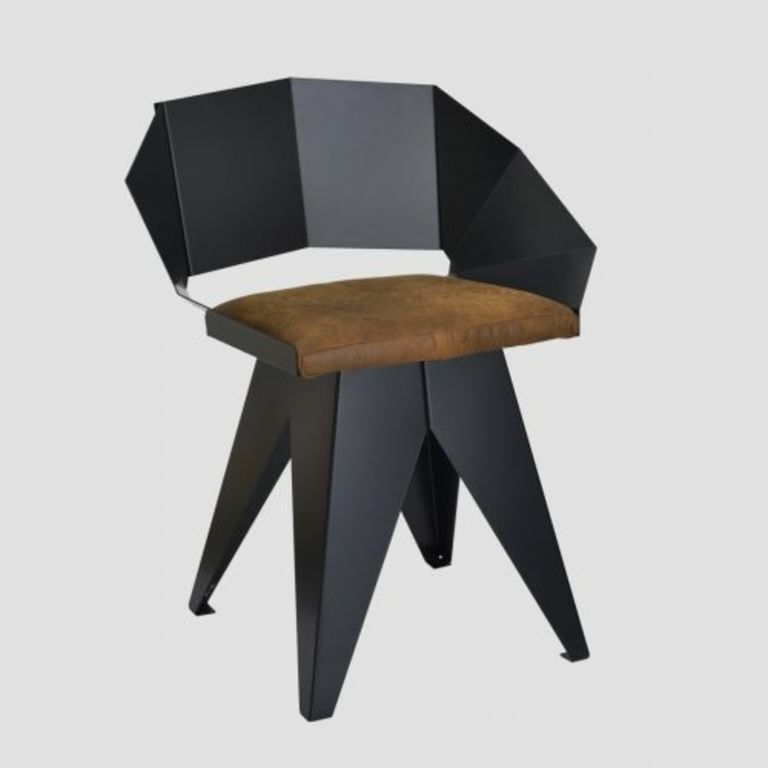 The original design of the chair makes it a perfect addition to commercial interiors – restaurants, hotels and offices. 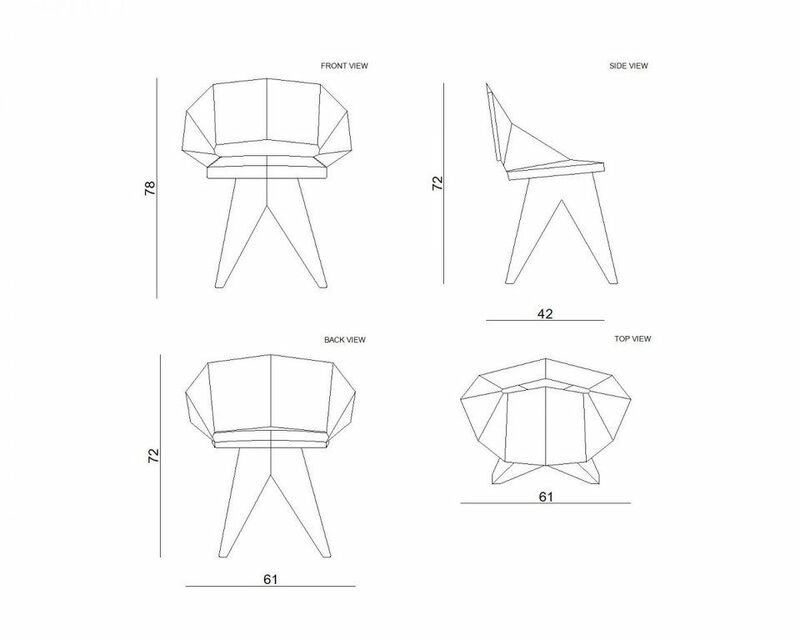 When designing Knight chairs, we thought about creating a piece of furniture that will surprise you with its form. Hence the idea of using a semi-circular shape in a more harsh, geometric form. 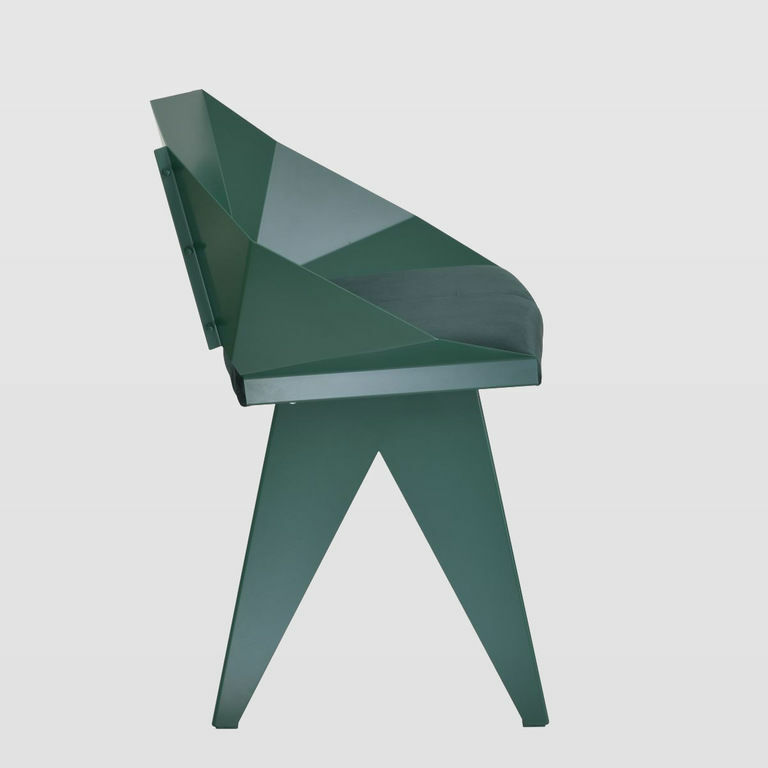 To slightly soften the raw appearance of the chair, we combined its steel form with the material seat. As a base, we used steel legs in the shape of triangles. Appropriate shape makes sitting on the chair very comfortable. 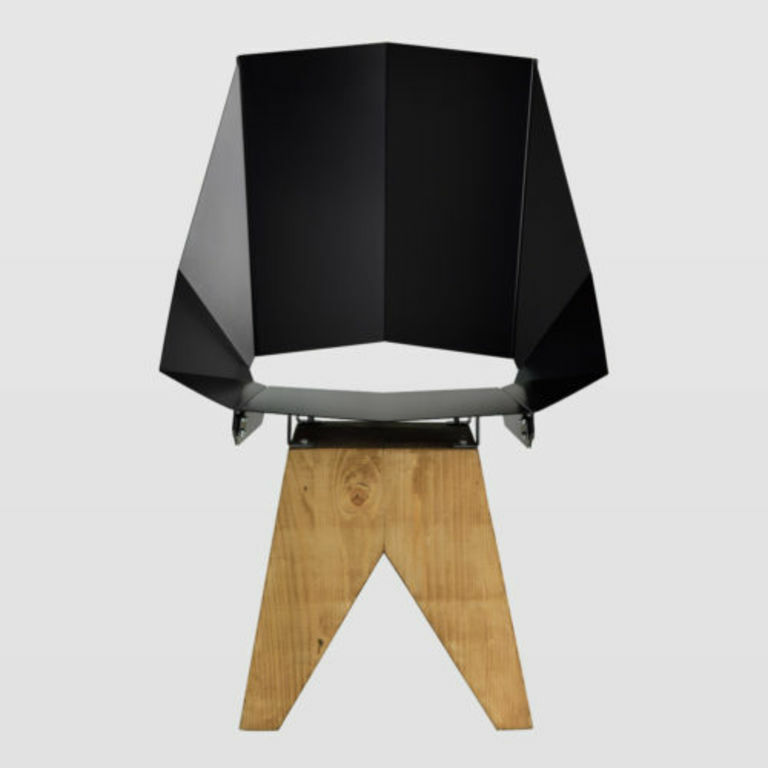 Knight is a symbol of practical design that you can use in your home. The Knight series consists of four chair models. They are available in different colors. You can choose models with a wooden base, wooden or metal legs. Seats in full metal or with a leather cushion. All this to best fit your needs. If you like this model of furniture, but you need it in other colors or sizes – write to us. We will try to fulfill your wish and create the piece of furniture you dream of. Due to the manual nature of the production, the dimensions, shape and colors of the product may slightly differ from those given on the website. Do you send products to my country? Answer: Of course! We send our products all over the world. Answer: You can check estimated delivery time on each product page. Usually, it takes us 10 business days to create product and prepare it to delivery. When package left our warehouse, it will be delivered to you in next 2-3 business days, depends on delivery adress. What if one of products have delivery time specified as, for example, 10 days, and the other 30 days? Answer: We split your order to two package. We'll sent products to you according to information about estimated delivery time, which we sent you on email. So, you'll receive first product after 10 business days, and the second one after 30 days. If you want to receive all products together, contact us. Is VAT included in price? Answer: Yes it is. All prices visible on our site include VAT. Answer: If the delivery adress is in Europe, delivery is FREE. If you don't live in Europe, you can check shipping cost after you add product to cart. Delivery cost depends on delivery adress and dimensions of package. If you have any doubts or questions, feel free to contact us. What couriers do you deliver products to? Answer: Depending on the delivery address and dimensions of package, it could be DPD, Fedex, GLS. If you order big and heavy product, like Organique bed, it's possible that we'll use dedicated courier. Can you change product dimensions or colors for me? Answer: Yes, we can. As a producer, we can change our products to fits your needs. Contact us and we'll send you information about additional costs and how long it takes to prepare it. I'm interior designer. Could you send 3DS/DWG files to me? Answer: You can download 3DS/DWG files from our site. Just check "Download" tab on interesting product site. It's not required to be registered/logged in user to download those files. It can happend that 3DS/DWG files weren't be upload yet - if it happens, please contact us. Do you work with interior designers/architects? Answer: Of course we do. If you are interested, contact us and we'll send you some details. You have great photos. I want to use them on my site/blog/publications/magazine. Could you send me them in high resolution? Answer: You can download hi-res photos for each product from our site. Just check "Download" tab on interesting product site. It's not required to be registered/logged in user to download those files. Please send us link to your publications, so we could post it on our site. I own a online/local store with furniture and accessories. Is it possible to sell your products? Answer: If you want to sell our products, contact us and we'll send you more details about cooperaton.